I have just been making a 1967 jacket. Prior to that a 1981 jumpsuit. 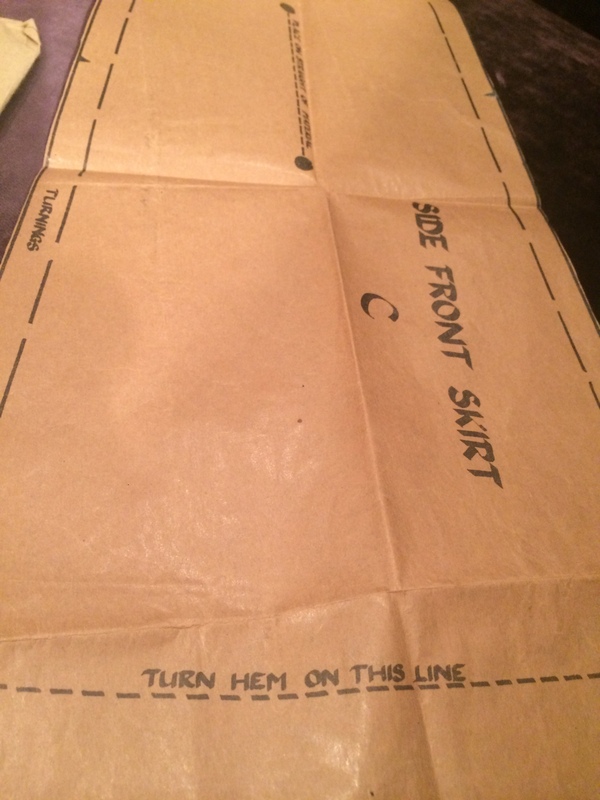 It occurred to me that even if I didn’t know exactly what I was making, not having access to the pattern envelope fashion drawings, I would know what decade I was in from the instructions alone. 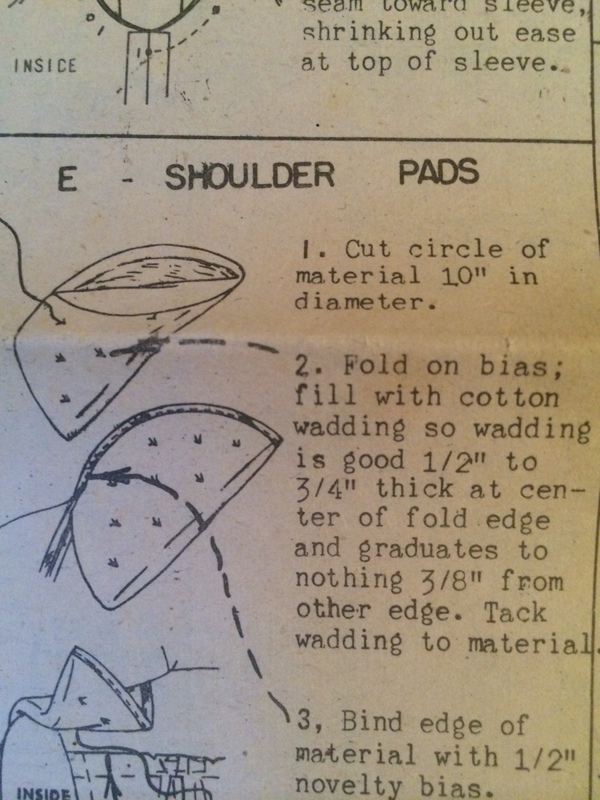 Some of the old instructions are so sparse and assumed you knew how to sew. In 1940s and earlier patterns there was an expectation that you could quickly draft some of the pieces such as facings, cuffs or underlaping. This economical approach to both fashion fabric and paper is a good discipline. Many older patterns give instructions for making tailors’ tacks, and indications of where these should be placed. The tacks marks the sewing line and allows great accuracy in matching seams and were important before seam allowance sizes were standardised. Our modern idea of using the edge of the fabric and the indentation marked on the sewing machine to create a nice even seam appears to have come in with the multi-sizing, where one pattern can be cut to any size say from a UK 6 to a UK 14. Today tailors’ tacks are considered old hat – I remember Tilly (and the Buttons) giggling in amazement when Ann Rowley started putting in tailors’ tacks (GBSB series 1). Modern patterns assume you will use carbon or tracing wheels to transfer markings. Like Ann I prefer to use tacks which I find as quick as any other method (or a washable felt tip on occasion). Then there are different methodologies for achieving an outcome. I don’t think a modern pattern would tell you to pad stitch, or use a continuous lap. Older – prior to the 1970s -patterns expected you to make your own fastenings, shoulder pads, and belts. Also, of course, the diagrams were charmingly hand drawn, and the instructions were typed out with a typewriter. Also I am pretty sure the heading, below, was prepared with a stencil. The instruction to put two rows of gathering stitches in a sleeve head dates from around 1958. Before then you were expected to know how to ease in a sleeve. A few things are very much of their time – technical involvations, such as iron-on interfacing for example. Until about 1968 the pattern just assumed that you were sewing it in. The requirement was to stitch with a long satin stitch along the seam lines, picking up just a little of the fashion fabric. Once stitched the interfacing was usually cut away from the seam allowance to reduce bulk. Again I usually prefer stitched-in than the funny melty stuff. Zips is another example – first zips of any type, then invisible zips. 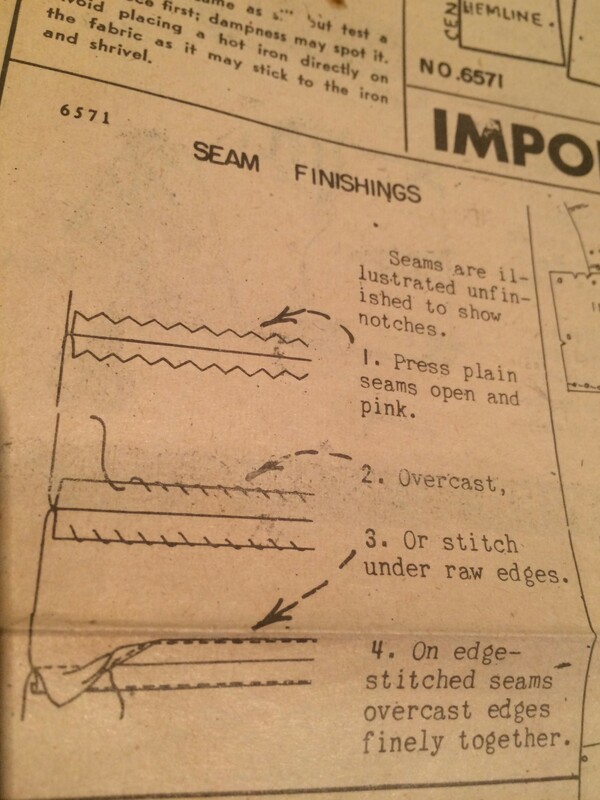 A 1950 pattern I was using gives the option of making a placket or using a “slide fastener” – not yet called a zip. Pre-1960 the norm was bound button holes, even on blouses and dresses. And whereas from the 1960s onwards it was assumed you had would do your button holes on the machine, it was around the 1975s that it was assumed you had an automatic button-holer on your machine. Older patterns often tell you to “finish” your seams using stitching under, overcasting, pinking or – for coats and jackets -binding with bias binding (when purchased this was called “novelty bias”). Although I have an old book that describes how to pink seams with a small pair of sharp scissors, pinking shears were widely available from the 1930s onwards. In the 1970s and 1980s using a zig-zag stitch to finish the edges was proposed – I was taught to finish in this way and a great result can be achieved if you get the zig zag the right size on a good machine. These days even rank amatures seem to own an overlocker. Me? I like to line my garments. Obviously the older patterns are pre-cut in the factory and marked with perforations. 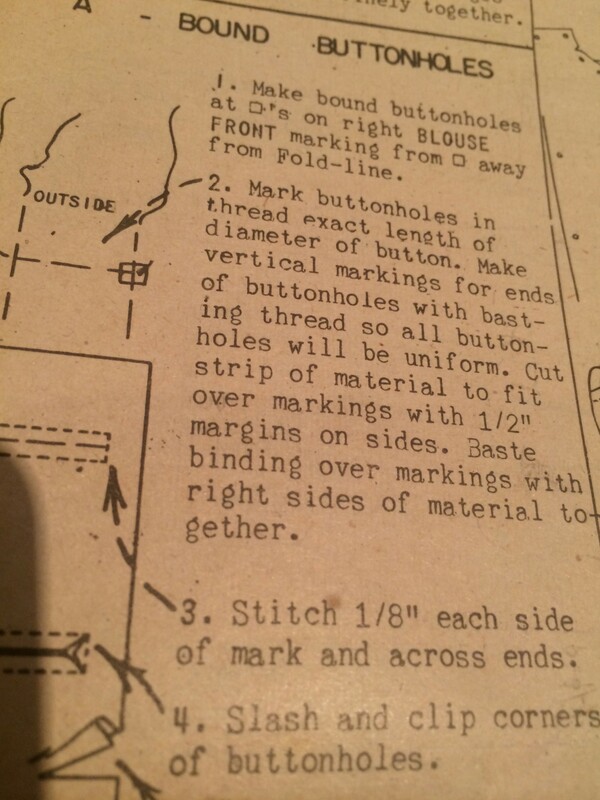 I have a 1947 pattern that seems to be printed on brown paper with italic handwriting. Printing on the pattern piece came about in the late 1950s. The patterns of the 1960s were generally one specific size, with multi sized patterns coming in around 1980. 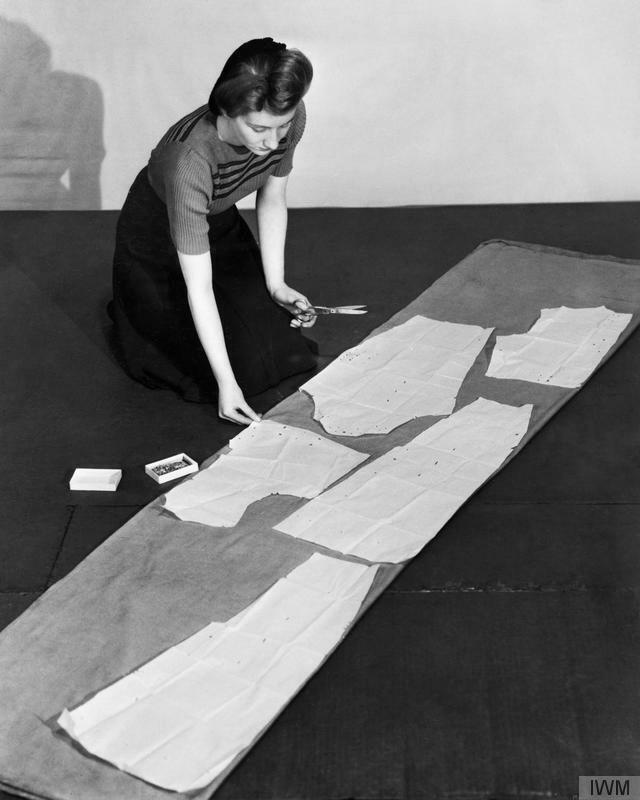 During this period the pattern itself often contained lots of instructions – how to put in a zip, and the order of work (steps in the construction) were in numerical order on the pattern too. Little dots would show where to put in a tailors tack, often showing the hem line, the side seams and areas to ease between. One thing makes me laugh is the idea of certain garments being “Easy” “Simple” “Quick” – which so depends on your standpoint and experience. What is categorised as simple or easy today would be the kind of garment that everyone would know how to make without a pattern a few decades ago – an apron, pyjamas, a gathered or elasticated waist skirt, a babies dress or kids shorts. 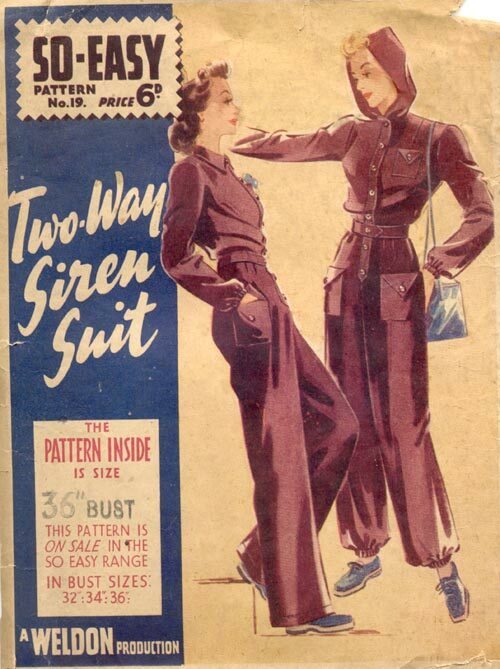 I love this Second World War “siren suit” but few modern dress makers would breeze through those pockets, collar, button holes, hand made belt, gathered cuffs and hood. I have never worked with really old patterns – say from the 1920s or 1930s. Have you? And anything else you have noticed about old patterns? Apart from the funny smell and rusty pins? I inherited my husband’s Grandmar’s (sic) stash of patterns. I’m drawn to vintage everything but have to admit they freak me out a little. There are so few markings and those perforations? Also the sizing seems minuscule, not sure where I’d start altering for my man size shoulders and increasingly generous bosom. Those styles are so cute though not so ‘easy’. If anyone is interested in modern day patterns w a retro experience – do give Style Arc patterns a go. Great designs, RTW fit, sparse instructions! Fascinating. Thanks for this post Kate. Very interesting and really shows up my own relative lack of knowledge! But I do love a tailor tack. You know you have the germ of a book here — a history of changing women’s culture as shown through sewing patterns and techniques? Have you seen Pattern Vault fk? It is brilliant, and Sarah will undoubtedly write a book one day. I just read this, your comment, as I haven’t been able to access your blog for a few days. I see you’ve been having problems. You’re not showing up on my list of blogs I follow, so I may have to re-follow you. Although I did get an email notice of your latest post. I’ll have to check some more. I clicked on Pattern Vault, but the server told me there was a problem. What is Pattern Vault? A blog? Now I’m going to see if this sends. cheers, you can call me felicia. I love vintage patterns – I have several but to date, have only ever used a couple; that said, in addition to your thoughtful list, I also enjoy the fact the pattern pieces are all separate rather than on one giant sheet of tissue paper (which inevitably gets ripped by an ever-curious kitty) as well as the thoughtful built in holes for tailor’s tacks (which although I’m a “modern” seamstress, I much prefer over other methods as well). Good point on the fact that the pieces are already separate – and I too love those little holes for TTs. It really helps to get the seams nice and even.